Khorixas is a town of 6,000 inhabitants in southern Kunene Region, Namibia. 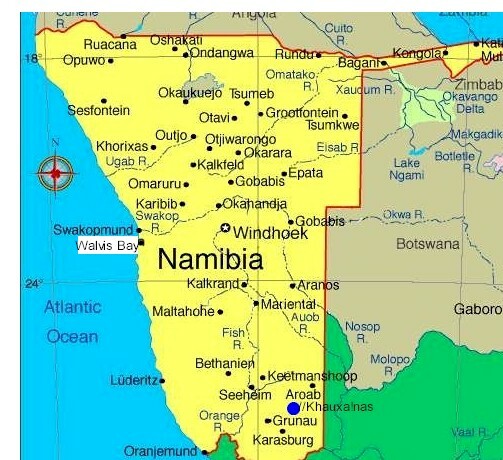 It was previously the capital of the Damaraland bantustan prior to Namibia's independence. It is located in Khorixas Constituency. Most of the inhabitants are from the Damara ethnic group. The town is located close to a petrified forest and the Twyfelfontein valley, known for its rock art. The regional hospital and some other regional offices are still located in Khorixas, though the capital of Kunene Region is Opuwo. There are six schools and one branch of University of Namibia (UNAM) in Khorixas, Versteende Wood as the biggest primary school and Cornelius Goreseb High School is the biggest secondary school. Other schools are: Eddie Bowe, Welwitchia Primary School, Welwitchia Secondary School and Th. F. |Gaeb. As of 2009, Khorixas suffered from a lack of economic development and employment opportunities, which led to frustration and outward migration among many of the town's youth. In February 2004, Mayor Gerson /Goagoseb and two other town councillors were dismissed from their positions by their party, the United Democratic Front, a day after a government audit began on the town's financial dealings. In May 2005, UDF removed Marta Claasen as mayor following internal council elections in which she collaborated with SWAPO councillors in order for her to obtain the position of mayor. She was expelled from the party and replaced on the council by Efraim Gariseb. UDF had four seats on the local council and SWAPO had three. Immanuel //Garoeb, also of UDF, became acting mayor. Claasen later claimed that she was replaced because of her stance on corruption and mismanagement. In the 2010 local authority election, a total of 2,788 votes were cast in the town. UDF won with approximately 58% of the vote. Of the two other parties seeking votes in the election, SWAPO received approximately 39% of the vote, followed by RDP (2%). Khorixas has a semi-arid climate (BSh, according to the Köppen climate classification), with warm to hot summers and mild winters. It borders on a desert climate (BWh). The average annual precipitation is 233 mm (9 in). The Robber Chanties, which in August 2010 played in the Northern Stream Division One and sought promotion the Namibia Premier League, are based in Khorixas. There are no tourist attractions in Khorixas. 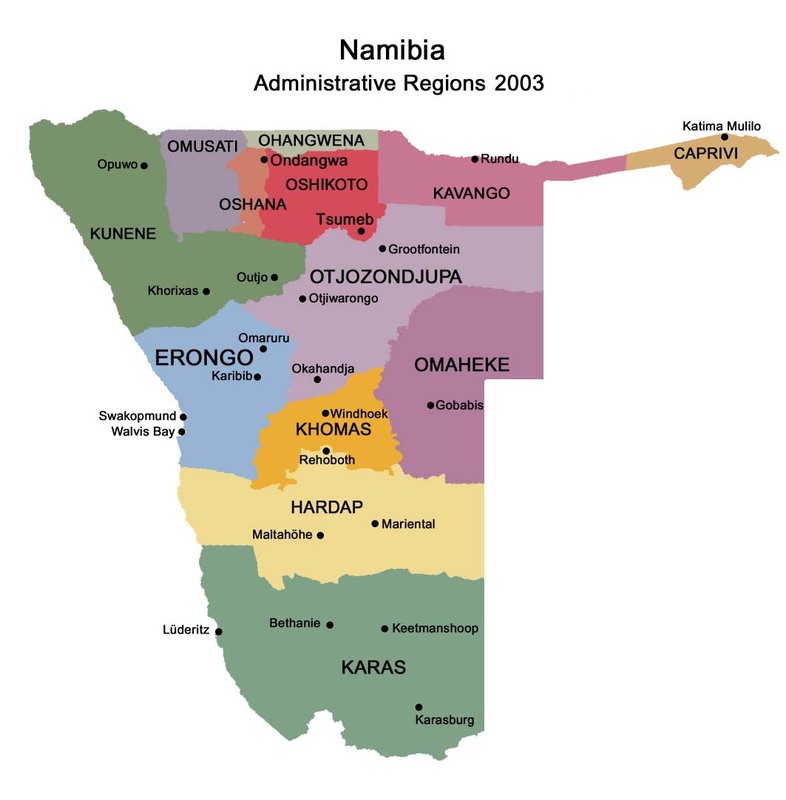 It is administrative centre of the Kunene region and capital of Damaraland. The only bank in the whole of the Kunene region (Standard, with ATM), 24-hour garage, bakery, butchery, supermarket, small craft market and post office. Curio hawkers and beggars regularly pester tourists as they fill up with fuel; ignore them and buy your curios at the craft market, or at the Petrified Forest further west. West of Khorixas the D2620 winds its way though the mountains, following the Aba-Huab valley into the picturesque heart of Damaraland. If you are lucky, you might catch a glimpse of the desert elephants along the dry river course (and there is usually spoor to be seen on the road). During the heat of the day the beasts tend to remain in the shade of the large trees. East of Khorixas, also known as the Kalk Kegel or 'limestone skittle', the Vingerklip is a 35m high limestone rock sitting on a 44m circumference base. This unusual land mark was formed by erosion of the Ugab River floodplain over a period of 30 million years. There is no fee to explore the site, and there are numerous walks that offer different angles of view of the unusual skittle. Perhaps the best is to be had from the Vingerklip Lodge itself, which will sell the heat-sapped day visitor a meal or snack, and even provide a swim in one of their pools. The Ugab Terrace is visible all along the valley, and offers good hiking opportunities.